So here we are – 5 years old and alive and kicking! Thanks to all the Puzzle faithful who made it down to our birthday extravaganza – and what a party it was! Top notch sets from all our ressies – some truly beautiful trance from Matt Church, some rip roaring tech trance from LK and the one and only Phil Reynolds plus the usual psychedelic champagne from Andi Leppard and Phil Lankester. Headline guest Nick Sentience showed why he’s one of the most in demand names on the scene today with a set of pure psy mixed with flawless skill, and London legend Timmy Whiz closed things out in his inimitable style! Of course the famous Puzzle regulars gave as good as they got, and we couldn’t have asked for a finer atmosphere to celebrate our birthday. A very successful half decade of delighted dance music fans with the very best in underground is behind us – but we have our eyes fixed firmly on the future, and fully intend that our sixth year will be the biggest yet! More of the biggest guest DJs you’re likely to see in such an intimate venue, more underground music from the cutting edge of dance, and of course the same team of residents – London’s finest! So read on for our first line up for year 6….. This month, the superb Liam Melly makes his third (yes, third!) appearance for Puzzle. He’s dropped trance bombs on some of the world’s biggest trance labels, such as Fraction, Discover and Paul Van Dyk’s Vandit, most recently collaborating with Bryan Kearney on trance anthem ‘The Other Half’. He’s rocked dancefloors all over the world, from ‘Lush’ in his native Northern Ireland to the legendary Amnesia on the White Isle – and on past visits to Puzzle he’s showed exactly why he’s landed such massive gigs. Partygoers are in line for some upfront, exclusive unreleased material, seamless mixing and some simply jaw dropping euphoria! 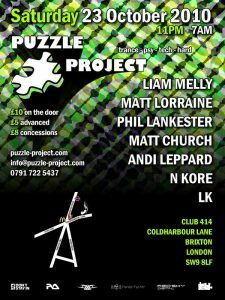 We’re also pleased to welcome back Nkore for his second appearance at Puzzle. His debut came about when his demo landed on our desk at Puzzle HQ – you know it must have been special – and he turned in a simply massive first set, an awe inspiring tour through the highs and filthy, filthy lows of the psy trance sound that left the 414 floor seriously impressed. Expect more of the same this month from this Gallic wonder DJ! Next up we welcome the South Coast’s number 1 party animal to the Big Smoke, none other than Mr Matt Lorraine! Matt’s Psy Co nights are well beloved of Portsmouth clubbers, and we thought it high time we invite him up to Brixton to spread a little mayhem. He’ll be going head to head with our very own psy wonder kid Andi Leppard in a back to back encounter that’s sure to be highly explosive! This will be a sneaky taster of what to expect at the massive Halcyon party forthcoming on 19th November, where these guys are set for a b2b rematch in the HOMmega room! No Puzzle would be complete without London’s favourite DJ, Phil Lankester aka Libra 9. Again, this month he’ll be warming up for Halcyon in November, where he’s one of the headliners in the HOMmega room – alongside scene legends Astrix and X-noize! Any Puzzle regular will know exactly why this is – cos he’s simply one of the most talented and exciting psy trance DJs out there right now! 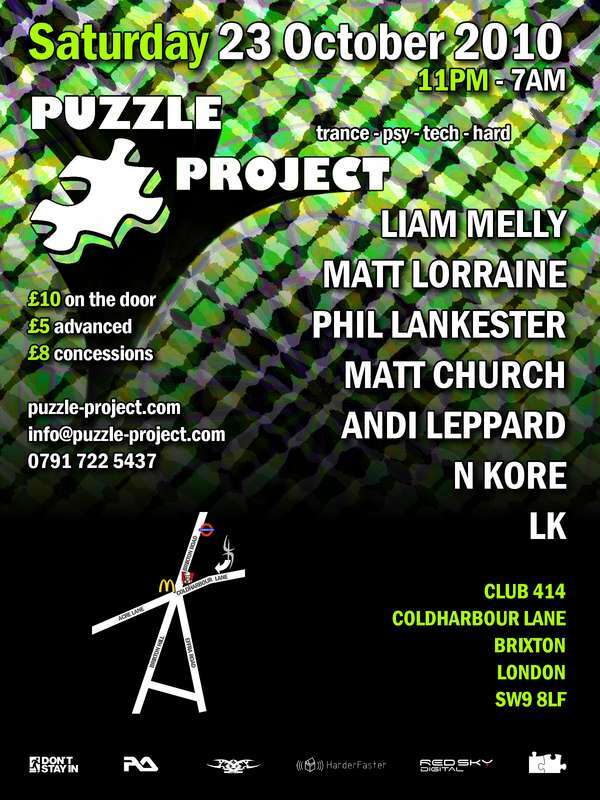 Another key piece of the Puzzle, Matt Church will as always be providing a dose of top notch trance. 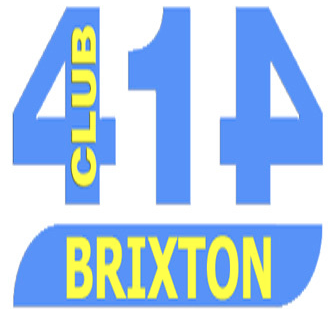 Expect quality driving trance, delivered with style by one of London’s most experienced DJs – Matt knows exactly how to read a crowd, and with stacks of exclusive material from his role as Red Sky Digital head honcho you’re in store for a rip roaring ride through the very best in trance! Completing our line up for October is Puzzle resident DJ LK. LK really impressed at our birthday party with a blistering set of tough as nails tech trance, and he’ll be doing this same again this month for sure. Techno, house, progressive, uplifting trance, all of it makes an appearance in LK’s wallet – this DJ is sure to surprise you, so make sure you don’t miss out on his set! See you on the 23rd – make sure you don’t miss London’s biggest small party!